Oracle Interim Patch Installerバージョン12.2.0.1.6 Copyright (c) 2017, Oracle Corporation. All rights reserved。 PREREQ session Oracle Home : /u01/app/oracle/product/12.2.0.1/dbhome_1 Central Inventory : /u01/app/oraInventory from : /u01/app/oracle/product/12.2.0.1/dbhome_1/oraInst.loc OPatch version : 12.2.0.1.6 OUI version : 12.2.0.1.4 Log file location : /u01/app/oracle/product/12.2.0.1/dbhome_1/cfgtoollogs/opatch/opatch2017-09-20_15-03-51午後_1.log Invoking prereq "checkconflictagainstohwithdetail" Prereq "checkConflictAgainstOHWithDetail" failed. The details are: There is a prereq/overlay cycle exist in being applied patches. Summary of Conflict Analysis: There are no patches that can be applied now. OPatch succeeded. There is a prereq/overlay cycle exist in being applied patches. [oracle@rhel73-12201 26609817]$ $ORACLE_HOME/OPatch/opatch apply Oracle Interim Patch Installerバージョン12.2.0.1.6 Copyright (c) 2017, Oracle Corporation. All rights reserved。 Oracle Home : /u01/app/oracle/product/12.2.0.1/dbhome_1 Central Inventory : /u01/app/oraInventory from : /u01/app/oracle/product/12.2.0.1/dbhome_1/oraInst.loc OPatch version : 12.2.0.1.6 OUI version : 12.2.0.1.4 Log file location : /u01/app/oracle/product/12.2.0.1/dbhome_1/cfgtoollogs/opatch/opatch2017-09-22_19-40-05午後_1.log Verifying environment and performing prerequisite checks... OPatch continues with these patches: 26609817 続行しますか。[y|n] ★ yを押そう！ y User Responded with: Y All checks passed. 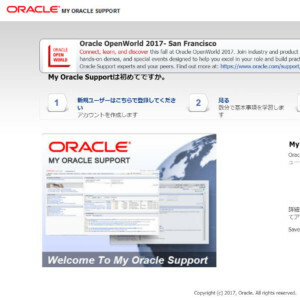 ローカル・システムのこのORACLE_HOME以外で実行しているOracleインスタンスを停止してください。 (Oracleホーム = '/u01/app/oracle/product/12.2.0.1/dbhome_1') ローカル・システムにパッチを適用する準備ができましたか。 [y|n] ★ yを押そう！ y User Responded with: Y Backing up files... Applying interim patch '26609817' to OH '/u01/app/oracle/product/12.2.0.1/dbhome_1' コンポーネントoracle.oracore.rsf, 12.2.0.1.0にパッチを適用中... コンポーネントoracle.ctx, 12.2.0.1.0にパッチを適用中... コンポーネントoracle.rdbms.deconfig, 12.2.0.1.0にパッチを適用中... コンポーネントoracle.rdbms.rsf, 12.2.0.1.0にパッチを適用中... コンポーネントoracle.rdbms.rman, 12.2.0.1.0にパッチを適用中... コンポーネントoracle.rdbms, 12.2.0.1.0にパッチを適用中... コンポーネントoracle.rdbms.util, 12.2.0.1.0にパッチを適用中... コンポーネントoracle.rdbms.dbscripts, 12.2.0.1.0にパッチを適用中... コンポーネントoracle.tfa, 12.2.0.1.0にパッチを適用中... コンポーネントoracle.rdbms.rsf.ic, 12.2.0.1.0にパッチを適用中... Patch 26609817 successfully applied. Log file location: /u01/app/oracle/product/12.2.0.1/dbhome_1/cfgtoollogs/opatch/opatch2017-09-22_19-40-05午後_1.log OPatch succeeded. Patch description: "DATABASE RELEASE UPDATE: 12.2.0.1.170814 (26609817)"